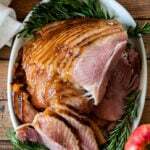 This super easy Crock Pot Ham Recipe is glazed with honey, brown sugar and apple cider then slow cooked to juicy perfection. Coat crock pot with nonstick spray and place ham, cut side down inside. Press the brown sugar all over the spiral cut portion of the ham then drizzle the honey over the top. Pour in the apple cider and add the rosemary around the ham. Transfer ham to a platter and cover with foil to keep warm. Meanwhile scoop out about 1 1/2 cups of the liquid from the crockpot and place in a small saucepan. Bring to a boil and cook until sauce is reduced to about half. Brush the ham with the reduced sauce. Slice and serve! *If your ham is too tall for your crock pot, cover with foil and place lid of top to keep it down.